The construction of additional accommodation at the University of Witwatersrand’s Barnato Hall of Residence will provide a hundred and fifty students with new rooms by the end of 2019. 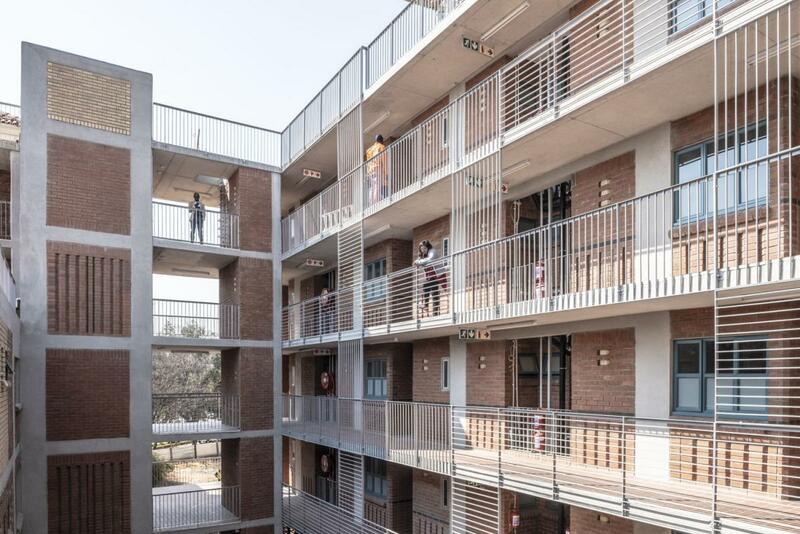 Although modest in the face of the national shortfall of 250,000 beds (according to the Department of Higher Education), the project demonstrates an innovative approach for universities to provide quality yet cost-effective accommodation by extending their existing residences. The brief from the university was to accommodate as many students as possible using readily-available, low-maintenance materials. Two core values guided the architects: ‘To make design work hard’ and to ‘recognize the extraordinary in the ordinary’. Deckler explains: “This means that every design decision does more than one thing and that the everyday experiences are enhanced through design.” The sound of water from the nearby pond and the views into established trees, over the roofs and beyond, lend a sense of tranquility and expansiveness to the introverted spaces of the original building. Over the years, 26’10 has refined their approach of combining new and old in several award-winning projects. “We do not see the existing as sacrosanct nor as something that should be completely remodeled. By adding on in a certain way buildings gain a new identity made up of both new and old.” At the time of receiving the commission, debates and protests regarding access to education and decolonization were raging on university campuses nationwide. “Extending an existing building designed in the late 1980s to resemble a Roman fort and named after a colonial Randlord presented us with an interesting opportunity to test our approach at a large scale,” notes Deckler. The design of the new brick façades took this approach a step further. Principal partner at 26’10, Anne Graupner, developed a concept for a woven brick skin that incorporates the textures and colours of the original building. “Working with Corobrik was an obvious choice for us and they completely embraced the concept,” explains Graupner. On a visit to various brick yards around Gauteng, Graupner discovered ‘under the tree bricks’ – specially shaped bricks left over from previously commissioned ranges that could be acquired at a lower cost. “Seeing these unique high-quality bricks gave us the idea to create a brickwork quilt using different colours and textures,” says Graupner. A standard red face brick complements the existing buildings and is interwoven with special bricks that are distinctive in colour and shape. A cream-coloured stock brick, matching the plastered surfaces of the existing building, is interspersed with darker bricks, providing carefully-placed highlights that animate the building. Bricks that were used include Village Antique, Midrand NFX (yellow), Onyx and Agate in a combination of single and double cants and bullnoses. Project architect and associate, Paul Devenish, managed the project from concept to completion and has this to say: “In order to translate our design intent into reality we had to really think it through. We tested patterns at a 1:1 scale using real bricks. We drew every visible brick in the building and made a 1:50 model with our drawings stuck to it to communicate our intent to the bricklayers and the client who bravely supported us.”. 26’10 employed Tebogo Ramatlo (a recent architecture graduate from the University of Johannesburg) to work with the brick laying teams and to help translate drawings and instructions. Corobrik stepped forward to assist with Alex Thobejame, their bricklayer trainer from the Gauteng Building Training School, who worked on site with the bricklayers. The shortage of quality student accommodation is a global challenge that is felt with particular intensity in South Africa, where education is seen as one of the chief means to overcome poverty. 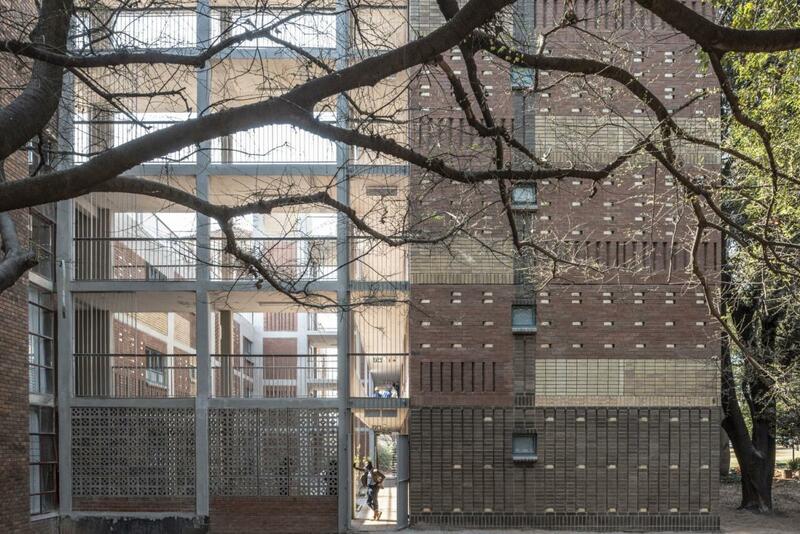 The project might just show a way to develop affordable and durable student accommodation, using brick to create joyful buildings.